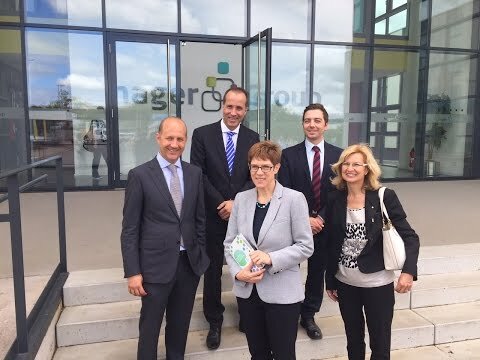 On Monday 27 July 2015, Hager Group, a leader in electrical installations and equipment, welcomed the Minister-President of the Saarland Annegret Kramp-Karrenbauer, who was met by Daniel Hager, president of the executive board, Johannes Hauck, corporate strategy and business development and Annelie Faber-Wegener, mayor of Blieskastel. After visiting the factory and the research and applications centre that was opened at the end of 2013, Daniel Hager, president of the executive board, and Annegret Kramp-Karrenbauer went for a drive in one of the company’s electric cars. They discussed topics such as the company’s future and projects, in particular the ‘Stromsparland’ research project on energy efficiency and renewable energies, which is supported by the government of Saarland. ‘We are delighted to have been able to show the advances we have made in innovation, energy transition, electric mobility and assisted living for the elderly,’ said Daniel Hager at the end of the visit.